Lynn Bennett Carpenter’s haptic sensations | Abler. Lynn Bennett-Carpenter is a fiber artist based in Detroit. Her work is often interactive, often site-specific, and a number of pieces are wearable, neither proper clothing nor purely functional tools. I asked her specifically about pieces from her “Fittings” series, and from her “Elastic Experiment” works. image description: two women in active poses, one appearing to “hold” the other in an elastic/fiber harness, both creating and restricting movement. 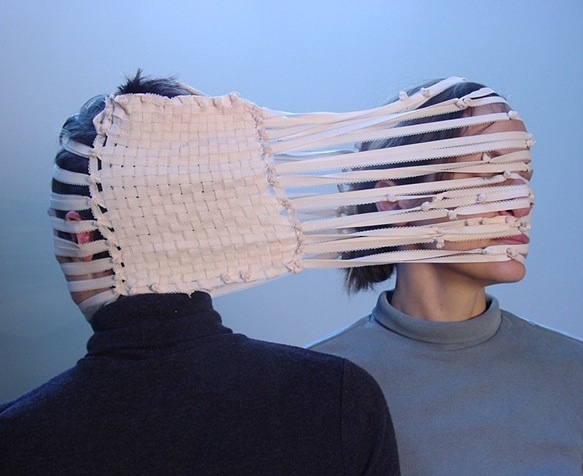 image description: two women share a single headpiece, a kind of two-person “mask” of woven elastic, the fibers connecting them and also stretching apart. “At first I made these pieces to see if I could create an artistic experience based solely on the sense of touch,” she said. I’m fascinated by the way the works are so tied to the body, but in unexpected ways—turning off the more dominant senses and engaging the skin and proprioception. image description: a woman wearing an elastic “fitting” that loops underneath both feet, and stretches to an elastic “cap” on the wearer’s head. 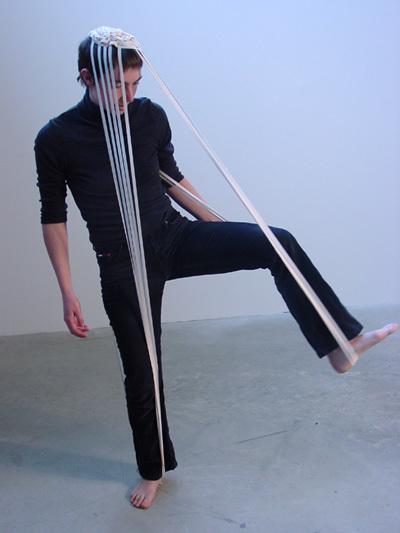 image description: a child in a whole-body suit, made of elastic panels and connected straps, providing pressure and interplay between and among limbs and extremities. Lynn wasn’t working with adaptive tech in mind, but you can see here the crossover between practicality and play. Lynn’s works have such great ambiguity—they’re elastic, so they constrain and confine the wearer one moment, just as they stretch and enhance the body’s movement the next. And it’s almost like they make the physics of movement suddenly visible—all those relationships among limbs, all the body’s weights and counterweights. bottom image: a single dancer in a white fitting, an elastic harness that wraps around the sternum and stretches to each foot, each hand, and individual fingers. Lynn worked with the Kingswood Dance Studio, under the direction of Kay Rediers, to create pieces as part of a collaboration and performance this past May. All images this post, except where noted, copyright Marcelyn Bennett-Carpenter.